Usually DCC systems powered by DC have a large “dead zone” around throttle zero because they need enough voltage to power the electronics before they actually do something, whereas an analog loco usually starts moving much sooner. The new LGB ones actually need to go to about 70% analog throttle, and the Bachmann TTTE (SoundTraxx) needs maybe 60% throttle. Yes, as Dennis suggested a DCC decoder fitted loco usually needs around 7 volts DC before the decoder electronics will wake up and recognise there is no DCC signal in the supplied power. It's then down to the decoder programming as to whether or not the loco will run on DC (that ability may have been turned off by the previous owner) I'm not aware of any large scale DCC decoders which don't support running on DC (in the small scales there are one or two decoders which don't). A better test though is to use a DCC programming track and try to read the decoder. The programming track doesn't allow high current and only powers up the track for brief pulses, it won't damage a non-DCC loco like placing on the main track can do. Dave, I have run my LGB DCC via an Arduino Uno using the DCC++ software. It works fine. Make sure you add a heavy duty 5-amp or larger H-Bridge to handle the G-Scale voltage and amps. Do not use an A/C power supply like the LGB 50110 or US version 50111. Only DC or you will destroy the Arduino. See Dave Bodnar's you tube video for more info on the heavy duty H-Bridge. I have had the engine since new and still have the info to read up on it. It will generate noise on the regular analog system - diesel only. And it recommends a supply of over 1 Amp. I will have to check the starter sets to see what they are rated at. So from all the replies i going to attempt o use the Open DCC++ code on an Arduino. In fact I have that loaded I just have to wire the power board arriving from Amazon and try a test. Thanks once again for the help. I'm sure once I get the basic engine running I 'll have lots more questions as I try to expand! I'm still awaiting my DCC system I ordered last June XD. So I wired it today and tested turning power on and off from the GUI and the analog test engine set off!! I tested the voltage on the 50081 analog supply and adjusted it to around 18volts. So time to test the 25552. I applied power and the diesel engine noises started - no smoke or flames - which are always a good sign. I now have to learn how to program the system to turn on lights and move the engine. At least that's what I hope I have to do next. Thanks for the help so far everyone! 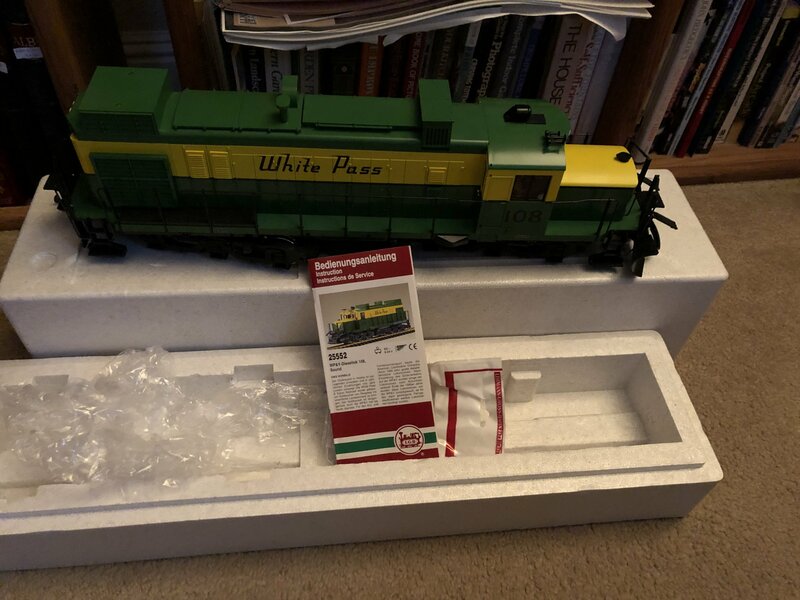 Pretty certain I did a decoder fitting on one of these, and the cab-roof light was red, only 'on' when the loco was travelling in reverse, and flashed.. I had to be a little more creative, to get that working.. So the onboard decode won't work with DCC++? Or was it just a problem programming the existing one. You are right that it has directional headlights and the red light flashes on the cab when running in reverse. Sounds are diesel start up, horn when moving forward and break squeal when stopping as far as I can tell playing with the analog voltages. I haven't worked out how to program the track or engine yet. I tried JRMI and it's not in the list of know ones. I tried reading values from the engine and they came back unknown. So I have more reading to do. I'd guess he did not rewire directly to the cab roof light... sounds like the lamp was still connected to the original flashing circuitry. So if you are reading back a value, you need to be in service mode, not programming on the main.. I'm not familiar with DCC++ being connected to JMRI, but it appears a TCPIP or a USB connection can be used, which are you using? I have a Mac connected to an Arduino via USB. 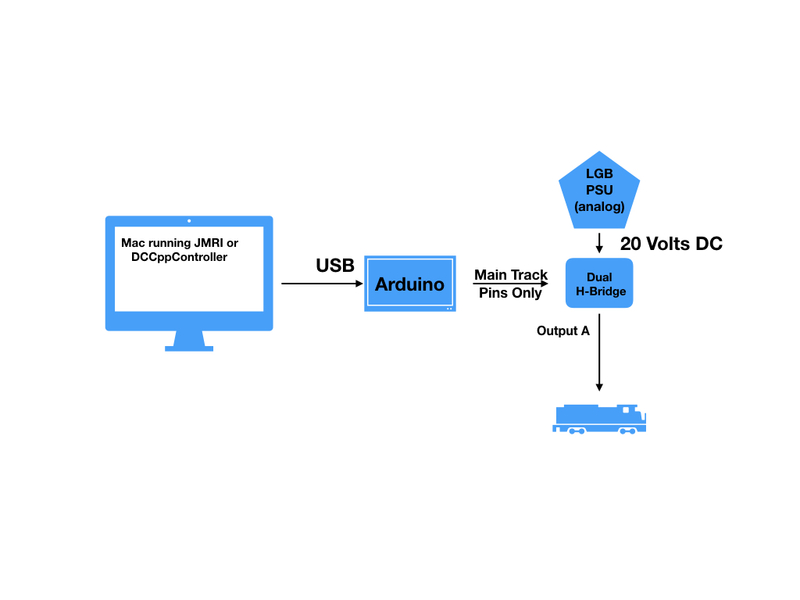 Arduino to track via a dual H-Bridge. I have only connected one output so far. (Attached an image of test set up) I used JMRI and tried the use the main track for the programming option. That's how I read a value. I didn't try writing any values yet as I'm still reading up. Both JMRI and DCCpp talk to the track via the Arduino and H-bridge without problems as I can tell. So, no offense, but do you know the difference between "service mode" and "programming on the main"? How do you control that with your DCC++ system? Also, when in service mode you should not really use the entire layout, and definitely nothing else that a single loco on the track. If none of this makes sense, or is the first time you heard it, you do indeed need to read more. No offense, I said newbie.. I have seen track mode and program mode, but not service mode. I assumed the program mode was to set things up. I only have one engine at the moment so was just testing what could be accomplished with an Arduino and the engine I had. So more reading is definitely the next step. Do you have a recommended write up? So, "service mode" is the correct term, that used by the NMRA, who wrote the spec. The reason I stick to it, is there are 2 different scenarios where you can program a decoder, so using "program mode" is ambiguous. "service mode" is where you can read back information, but you cannot run the loco. "programming on the main" is available on the track where you cannot read back information but you can run the loco. so, you are looking for putting the system into the mode where it can read back... no other devices can be connected and the power to the rails will not run the loco. Once you have that clear, then the inability to read back values can be debugged, you can have issues that interfere with the readback, but it's important to be in the correct mode first, since you can NEVER read back if you are in the wrong mode. I have used JMRI to find the engine, and try to match to a known type. This resulted in address number 3, which upon reading is default. I then found out several of the function buttons that appeared in the throttle window turned on the sounds. So no I now have an engine with a throttle control and labeled functions for my sound, including a mute button. But I can't get the train or the lights to function. I assume the lights, as they are tied to the motion of the engine, will function once I get it to move. But it's not moving! I tweaked CV 29 to be 2 instead of 18 turning off using internal speed control thinking that might be it. But no. Looking at the DCC++ serial window there is data sent when I move the throttle. So do I still have a value wrong? Or do I still have a miss conception about having the train run? I have forgotten which decoder you have..
Internal speed curve/control/steps means using the default set of values for each speed-step in the decoder.. Unless you know what these settings are (they could all be zero) you do not know how the loco will respond. Put CV29 back to 18 for a start. If the decoder has been reset, then the lighting outputs will very probably been reset to full track voltage. If you have 5v bulbs, it may well have blown them. If it is not running, it could be the switch is not set correctly in the cab. - Though this switch may no longer be fitted, or may be disconnected, if DCC was not originally installed. Try different positions of the cab-mounted switch. - This presumes a LGB loco. Have you read enough to get the makers id for the decoder, and possibly the model and software version? Do you have an analogue power supply? - analogue may be turned off in the decoder, but it might be worth seeing if the loco runs on DC? I have a LGB 25552 engine which according to the box is analog an digital. I used the JMRI program to identify the engine and went form there. There is no LGB entry so it came up with another company: Veissman and I chose 5245 at random. I assume the CV values are for this model, whatever it might be ( will google it later). I wanted to use it as a starting block. As I got the sounds to work it seems the right idea. The cab switches available are only to allow lights, sound or both and a volume control. The lights only come on during motion using a analog transformer. So the engine works in analog DC mode with a 50081 power unit. Depending on the analog control dial position determines what sounds come out. Low DC voltage engine start slow start can get the horn to blair and a slow stop can get the sound of breaks squealing. I never knew I had the station announcement or the bells unit I got it connected to the the digital system. Been reading more on the CV values and was wondering if I need to adjust CV 2 the Start voltage. It's set at 1. I also read I need to have the speed or power in 128 steps for LGB not 256, so I'm trying to look at setting that. So still reading and tweaking values. CV2 being one will not cause the loco to not move. I suggest you reset the decoder, and try address 3. It's already at address 3. I read in the dummy's guide on this forum that reseting by writing to a CV was not recommended. Is there another way? 1) I have insufficient power - the analog supply outputs ~1Amp turned up full. 2) My CV values are still wrong. 3) I'm still trying things in program mode or service mode and haven't got to main mode. So in that case I'm totally confused. The train runs fine in analog mode, that is the power supply connected directly to the track no DCC hardware in the way. Once gain I assume that DCC++ is working as I can control sounds and turn power on and off on the track have programmed a CV value - so my arduino and H-bridge power board must be working.